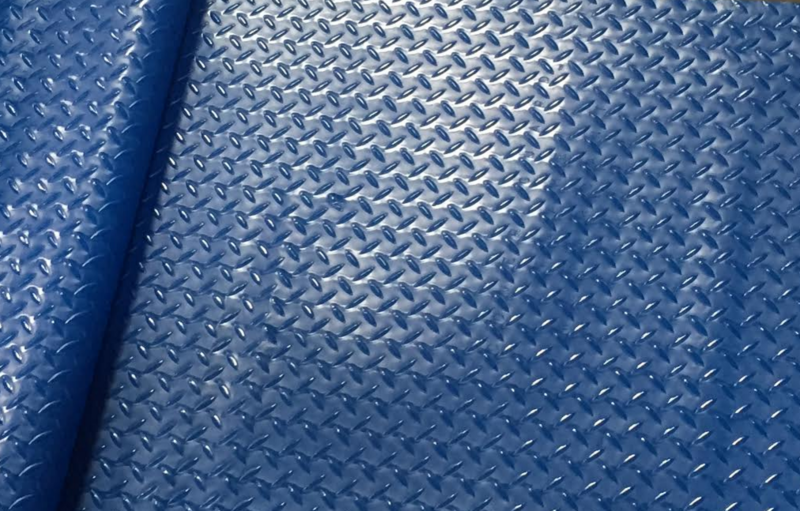 GPS DeckProtek Diamond Tread™ (in blue) provides the utmost in Fire Retardant surface protection for a wide variety of surfaces. If workmen damage is eating into your profit margins, this is the product for you! This formulation is soft and supple, described as rubber-like, so it rolls out very easily, and lays completely flat. The bottom of the film is “soft” enough that it does not want to slip around on smooth surfaces, making it much easier to hold in place. The top is a diamond tread that makes it anit-slip or skid. GPS Diamond Tread™ takes the worry out of using surface protection over surfaces like PRC Decking used on Navy Ships. Standard thicknesses are; 10 mil, 13 mil, 25 mil. Custom products, colors and thicknesses are available. Please contact us for further details.